Congestive heart failure can be consequence of several different illnesses. They may not be related to the heart, but they can nevertheless determine the occurrence of this condition. Congestive heart failure is a chronic condition that develops when the heart has difficulties pumping the blood to the rest of the body. Because of this, it is difficult for the cells to receive oxygen. It can affect either the left side or the right side of the heart, but at times it can compromise both sides. As it develops, the blood can accumulate in other areas of the body, which causes fluid retention. Due to this, other organs of the body tend to suffer grave consequences. Also, this generates inflammation that tends to manifest itself in problems with the lungs, liver and the gastrointestinal tract. It doesn’t tend to have a drastic effect in the early stages. Within days, however difficulties occur. These can appear in the form of fatigue, irregular heartbeat, difficulties breathing, and other health conditions. In the majority of cases, it is produced by other cardiovascular illnesses. In this article, we would like to share in detail the 7 potential causes. Coronary artery disease is produced by the accumulation of plague in the walls of the arteries of the heart. This condition is quite dangerous and can block blood flow. In more serious cases, it can cause a heart attack. A heart attack can be fatal, although there is a high probability of survival if caught at an opportune time. High cholesterol, high blood pressure, and diabetes increase considerably the risk of developing this problem. High blood pressure or hypertension occur when there is an increase of pressure in the blood that flows through the coronary arteries. This is a public health problem because it affects millions of people at a worldwide level. It is linked to many illnesses that increase the mortality rate. This is an asymptomatic condition that can cause grave and lethal complications when not treated. It is important to control blood pressure to avoid harm to the heart, kidney problems and cognitive problems. Dilated cardiomyopathy is a progressive cardiac muscular illness that is characterized by ventricular dilation. It is the third most common cause of heart failure. Also, it is one of the common reasons for a heart transplant. The principal risk factor has to do with heredity. It is also related to infections and exposure to toxins. Some metabolic and hormonal changes are caused by the thyroid gland. These have a close relationship to the increased risk of heart failure. 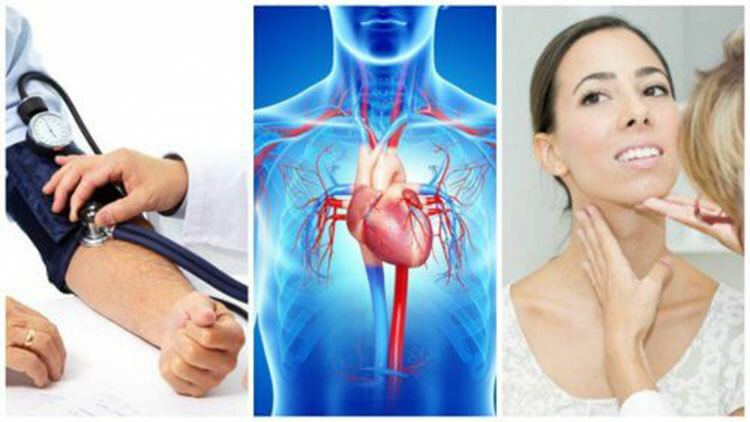 Hypothyroidism and hyperthyroidism can initiate changes in the cardiovascular and circulatory systems. Both can also cause damage to the heart muscle. In general, there is a group of internal and external symptoms that facilitate its detection and control. Even though many people don’t realize it, kidney function has a lot to do with cardiovascular, lymphatic and circulatory function. Due to disease, some kidneys cannot filter toxins and are not capable of balancing minerals. Thus, blood pressure problems begin and increase the risk of diabetes, heart attacks and urinary tract infections. Kidney disease, when severe and chronic, is principally responsible for heart failure in adults. Diabetes is an illness that is characterized by increased levels of glucose in the blood due to the absence of insulin. This hormone, secreted by the pancreas, is in charge of maintaining the levels of sugar in the blood. It also serves as a source of energy. Diabetes patients should keep sugar levels under control. This is especially true since diabetes in an advanced state can cause eye damage, nervous system diseases, and risks to cardiac health. Hemochromotosis is a hereditary illness that is characterized by the abnormal accumulation of iron in the tissues and organs. Given that this mineral cannot be metabolized effectively, it converts to a toxin in the organs such as the liver, heart and pancreas. Complications turn into diseases of the thyroid, diabetes, heart failure and other serious illnesses that affect the patient’s quality of life. The control and timely treatment of these conditions is key to avoiding congestive heart failure. If any abnormality occurs, the best idea is to get immediate medical help. I am 64. After my Congestive Heart Failure diagnosis in 2009 my first symptom were feet swelling, energy loss and chest pains. Suddenly I got weak and dizzy and had severe shortness of breath. My blood pressure was 200/100, respiration was 28 with oxygen saturation of 88 percent. I was extremely short of breath. My doctor started me on blood pressure medications, Lasix and nitroglycerin, the medications helped but not much. In January this year my PCP referred me to Rich Herbs Foundation, i immediately started on their natural organic CHF FORMULA treatment. I had a total decline in all symptoms including the leg and feet swellings, shortness of breath, fatigue, weight problems, excess urination, chest pains and others. Visit Rich Herbs Foundation web page ww w. richherbsfoundation. com. The CHF treatment totally reversed my congestive heart failure condition and most amazingly i can go about my daily activities!